Above the main door into the Georges Dock Ventilation Tower and Central Station is this statue: Speed – the Modern Mercury. The relief in Portland Stone (one of my favourite construction materials) is seven meters tall including the base. It was designed by Herbert J. Rowse and the sculptor was Edmund C. Thompson assisted by George T. Capstick. 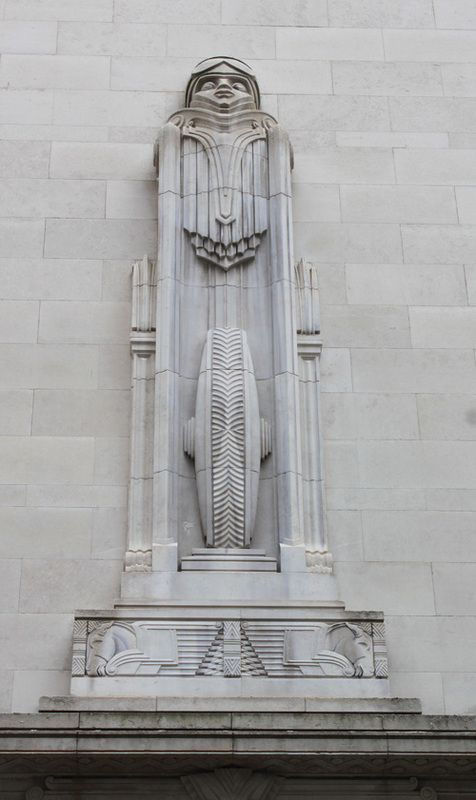 It is just one of the details on the art deco structures of the Mersey Road Tunnel that show the egyptian styling Sir Basil Mott, J. A. Brodie and Herbert J. Rowse included in the designs. For example each of the ventilation shafts takes the form of a stylised obelisk. The tunnel was constructed between 1925 and 1934 during the Egyptian craze following Howard Carter’s discovery of the tomb of Tutankhamun in 1922. I have an incomplete Planet of Danger short story Dirk Dangerous and the Mummy that features a climax in the tunnel. That is gorgeous. I love art deco, and that is an absolute perfect example of how it should be done. Love those art-deco sculptures - fantastic!